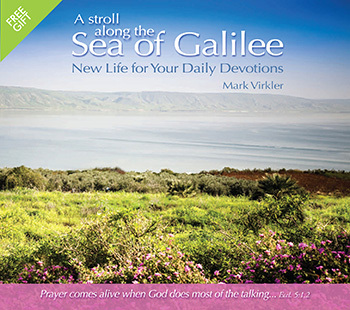 Home » Blogs » Mark Virkler's blog » The Sea of Galilee CD Introduces Groups to Hearing God's Voice! Youth Leaders Hear God's Voice! The youth leaders in our church had expressed a desire to receive training in praying for the young people following their services. I committed to meet with them. In addition to imparting to them various instruction I had learned over the years, I knew I was to share two-way journaling with them. We used the Sea of Galilee CD and all six of them (approx. ages 17-24) were encouraged in their ability to hear God’s voice. Some tears flowed during their time of writing, other tears came during the sharing time (from some I had not previously seen shed a tear). Thank You for breakthrough, Abba. So now, I’m seeking the Lord for His timing to schedule a School of Prayer for the children and youth where I would activate them in the gifts of the Spirit. Two-way journaling will most certainly be included! 80 Women on Retreat Hear God's Voice! The second report pertains to being able to activate about 80 women participating in a weekend retreat in Naples, FL. I was invited to be the guest speaker and felt strongly to introduce two-way journaling to them as a way to easily facilitate hearing God’s voice. After ministering to them regarding my personal journey in the ministry of praying for others, the healing ministry and our need for more of Holy Spirit in order to do the works Jesus did, I introduced the concept of two-way journaling, and we played the Sea of Galilee CD. Once the instrumental part started (after Julie True finished her introduction), I had them write a brief letter to the Lord. After about 5-7 minutes, they then chose one of the three questions suggested to ask God. As they began to write, the tears began to flow around the room. I knew hearts were opening and Holy Spirit was healing. Due to time constraints, I gave them only about 10 minutes to write...turns out, that was enough for breakthrough. I then asked for 2-3 brave women who would share, and they did...one being a renowned cardiologist, who had been a believer her whole life but never had this type of intimate experience before. She and the others were very grateful for being introduced to two-way journaling, to facilitate hearing from the Lord. I gave out all the free materials you gave me. This included the 4 Keys wallet size cards and the cards for a free download of the "Sea of Galilee" audio track (see below). I fully expect to continue hearing good reports in the weeks to come...will keep you posted. Once again, thank you so much for your faithfulness. YOU Can Now Easily Lead Your Friends and Groups Into Hearing God's Voice! 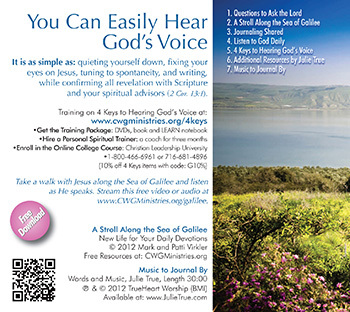 The #1 Tool in the World for Introducing People to Hearing God's Voice is the Sea of Galilee CD. Packs of 100 (50 CDs & 50 DVDs). Help change the world! Quantity Discounts Available - Help Spread the Fire! 20 or more Only $1.00 each! Help 100 people acquire the fire! Add value to any packets you are handing out! Extend the Kingdom of God by providing a practical tool for daily hearing God’s voice! The voice of the Wonderful Counselor provides healing and deepening of relationships! His creativity and guidance add blessing to everything one puts their hand to (Deut. 28)! Why not help bring revival and restoration to your nation by distributing this Free Offer since it is such a powerful tool! It is an ideal gift to slip in with cards for special days such as birthdays, Christmas, Father’s Day, Mother’s Day, Valentine’s Day and Easter. It is perfect for conference attendees, newborn Christians, or anyone you want to share in the gift of greater intimacy with the Lord.